Learning to assess speech and language disorders and write diagnostic reports may be an overwhelming experience, especially when most texts don’t cover both topics at once. With that in mind, A Guide to Clinical Assessment and Professional Report Writing in Speech-Language Pathology, Second Edition combines the latest assessment protocols and diagnostic techniques with vital diagnostic report-writing tools into a single definitive guide. 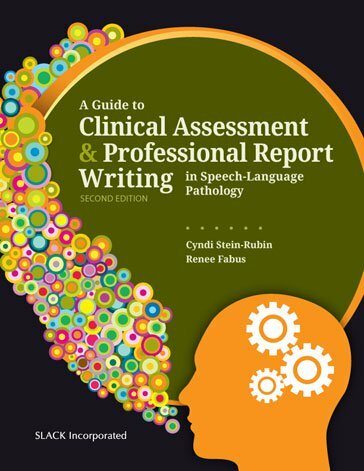 Cyndi Stein-Rubin, Renee Fabus, and their contributors recognize that clinical assessment is inextricably linked to report writing and have updated this Second Edition to synthesize the two. Following the introductory chapters, which discuss the basics of assessment and report writing, each subsequent chapter focuses on a particular disorder, provides in-depth assessment tools, and presents a corresponding sample report. The accessible format of A Guide to Clinical Assessment and Professional Report Writing in Speech-Language Pathology, Second Edition will help students learn how to assess and document speech and language disorders and will also make for a perfect reference for them as clinicians for years to come. Cyndi Stein-Rubin, MS, CCC-SLP, TSSLD, CTA-Certified Coach is a retired full-time faculty member, lecturer, and clinical supervisor in the Department of Speech, Language and Hearing Department at Brooklyn College of the City University of New York (CUNY). She is a certified speech-language pathologist, professional life coach, and specialist in the field of human development. Cyndi Stein-Rubin was the recipient of the 2009 college-wide Award for Excellence in Teaching and has served on the committee for the past 4 years to select future award winners. Her area of expertise is in coaching and counseling students, clients, and families in the area of communication disorders, and her private practice focuses primarily on adults with disorders of fluency and voice. Cyndi Stein-Rubin delivers interactive and experiential workshops and presentations, drawing from fields such as psychology, counseling, and leadership. She lectures at universities, in the community, as well as internationally. She is the first author of a coauthored textbook, A Guide to Clinical Assessment and Professional Report Writing in Speech-Language Pathology (Cengage Learning, 2012). Her second book is Counseling in Communication Disorders: Facilitating the Therapeutic Relationship, coauthored by Beryl T. Adler. Renee Fabus, PhD, CCC-SLP, TSHH is an Associate Professor in the School of Health Technology and Management at Stony Brook University in New York. She received her bachelor’s degree from New York University, her master’s degree in speech-language pathology from Teachers College in New York, NY, and her PhD from Columbia University, also in New York. Dr. Fabus is a certified speech-language pathologist who has practiced in a variety of medical settings for 21 years. She has taught and supervised in programs in the New York City area and published in the areas of speech sound disorders, aphasia, dysphagia, and stuttering. She has served on various committees, boards, and editorial committees at the regional, state, and national levels.